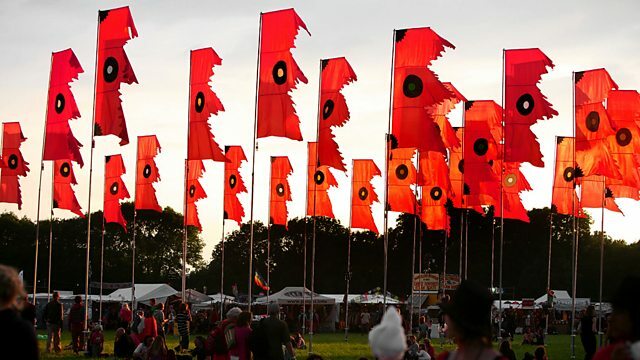 Mary Ann Kennedy and Lopa Kothari with highlights from WOMAD 2011, including Alpha Blondy, AfroCubism, Faiz Ali Faiz, Abigail Washburn and the Village and Mahala Rai Banda. Mary Ann Kennedy and Lopa Kothari are joined by Lucy Duran and Andrew McGregor for the first of a weekend of broadcasts from the globe's leading festival of world music, live from the festival site in Charlton Park in Wiltshire. Tonight's headliner Alpha Blondy comes live from the Open Air stage, with highlights from the mighty musical veterans from Cuba and Mali, AfroCubism; live from the Siam Tent is Pakistani qawwali singer Faiz Ali Faiz; and from Radio 3's own stage in the shady arboretum, Abigail Washburn and The Village from the USA, and Romanian gypsy band Mahala Rai Banda. Plus interviews and truck sessions, starting off a full eight hours of live broadcasting from WOMAD.